Israel's Defence Minister Avigdor Lieberman has ordered an immediate halt to fuel deliveries headed to Gaza in response to what he said were attacks against Israeli soldiers and civilians, his office announced on Friday. 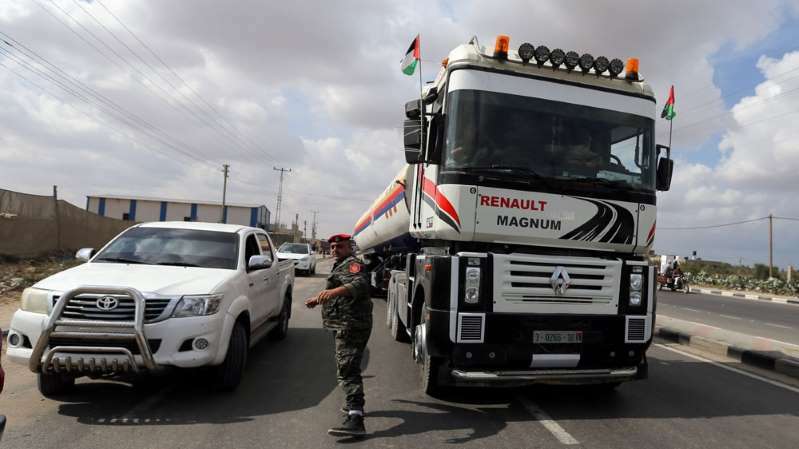 "Israel will not tolerate a situation in which fuel tankers are allowed to enter Gaza on the one hand, while terror and violence are used against IDF soldiers and Israeli citizens on the other," the statement read. "In addition, Hamas continues to welcome any terrorist attack and encourages the Palestinians, residents of the West Bank, to carry out attacks against Israel citizens. In light of all this, Defence Minister Lieberman decided to stop the flow of fuel to Gaza immediately." Qatari-bought fuel began arriving on Tuesday in a bid to alleviate the humanitarian situation in the besieged enclave and prevent any escalation in Israeli-Palestinian violence. "The Qatari fuel to the Gaza strip's power plant today is aimed at partially improving electricity [supply] in Gaza," Hamas spokesman Hazem Qassem said at the time. The announcement on Friday follows the killing of six Palestinians by Israeli forces during the ongoing March of Return Protests. Last week, Lieberman's office announced a further reduction to the Gaza's strip's fishing zone, from nine nautical miles to six. Lieberman said the measure was in response to "riots" along the fence dividing Israel and Gaza and a midweek beach protest in which fishing boats and protesters gathered at the northwest end of the Gaza strip. The United Nations has warned that Israel's 11-year blockade of the strip has resulted in a "catastrophic" humanitarian situation. Under the UN-brokered deal, Qatar pays for the fuel which is then delivered through Israel with UN monitoring, a diplomatic source said. A Qatari official, speaking to Reuters news agency on Sunday, said Doha planned to help with Gaza's power crisis "at the request of donor states in the UN, to prevent an escalation of the existing humanitarian disaster". Israel's energy minister, Yuval Steinitz, told Reuters on Monday that Qatar "was trying to help" prevent a Gaza flare-up. Hamas seized control of Gaza from Abbas's Palestinian Authority in a 2007 civil war, a year after it unexpectedly won elections in the coastal enclave, triggering a crisis in Palestinian politics. Hamas spokesman Qassem said that the deliveries were facilitated "through the United Nations because of the vacuum left by the PA."
Israel says its blockade of Gaza is necessary to isolate Hamas, with which it has fought three wars since 2008.